How much are Vietnamese willing to spend on Valentine’s Day gifts? By Hung Le &nbspFebruary 20, 2019 | 06:35 pm GMT+7 Vietnamese are likely to spend $56.1 on Valentine’s Day gifts. Photo by Shutterstock/MaxbelChenko Vietnamese are likely to spend VND1.3 million ($56.1) on Valentine’s Day gifts, a recent global survey found. Picodi.com, a Poland-based international e-commerce company that provides discount coupons to online stores in 41 countries, said its survey found men would spend VND1.45 million ($62.56) and women, (VND1.1 million). The survey polled 6,400 people in 38 countries where Valentine’s Day is celebrated. In Vietnam, 72 percent said they would be celebrating. The vast majority said they would buy gifts for their significant other (88 percent), while 6 percent would get presents for family and relatives and 3 percent for close friends. The purchase of gifts began to pick up two weeks before the day, especially of items such as jewelry and perfume. By February 13 and 14 the … [Read more...] about How much are Vietnamese willing to spend on Valentine’s Day gifts? The Human Capital Index (HCI) measures the amount of human capital that a child born today can expect to attain by age of 18, given the risks to poor health and poor education that prevail in the country where the child lives. The HCI index values are contended to convey the productivity of the next generation and highlights how ready are Asian youth to face a future of immense opportunities. 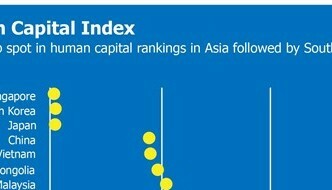 Singapore takes the top spot in human capital rankings globally. It has one of the most robust healthcare system, good education exams results and high life expectancy figures. It ranked first out of 157 economies suggesting that Singapore’s attempt to invest in its human capital will allow children to fulfill 88 per cent of their potential when they grow up. The top three countries that dominate the global index are Asian countries. South Korea and Japan follow closely at second and third position respectively, both in global rankings and in Asia. Both the countries have improved their … [Read more...] about How prepared are Asian youth for the future? VietNamNet Bridge - The Vietnam Logistics Association (VLA) says that logistics costs in Vietnam are 16-17 percent of GDP, not 20.9 percent as reported before by several institutions. VLA says the logistics costs are 16-17 percent of GDP Nguyen Tuong, senior advisor to VLA, said on the sidelines of the VLA annual conference on November 17 that logistics costs are one of the most important issues mentioned in the VLA 2018 White Book, the publication launched as the official voice on logistics-related activities. The Vietnam Logistics Association (VLA) says that logistics costs in Vietnam are 16-17 percent of GDP, not 20.9 percent as reported before by several institutions. The proportion is higher, 10-20 percent, in consumer goods, e-commerce, retail, garment and farm produce. Of logistics costs, the expense for transport services accounts for the highest proportion, 60-80 percent, followed by handling and customs services. RELATED NEWS Freight forwarding companies see … [Read more...] about How high are logistics costs in Vietnam? VietNamNet Bridge - Viber has been taking care of loyal customers, while LINE has set up an office and plans a return to Vietnam. Grab is striving to become a ‘super app’ which not only allows users to hail taxis, but also makes payments and has other services. Zalo, a messaging app, has developed e-wallet, while Foody’s Now is planning to jump into the passenger transport market. The race of the apps has raised questions about the fates of Viber and LINE, two apps familiar to nearly all Vietnamese before 2015. Viber once held 60 percent of market shares with 63 million users. It has also declared end-to-end message content encryption, affirming that the content is secured by a third party and Viber itself cannot read the users’ messages. RELATED NEWS LINE app to return to Vietnam? Vietnamese internet users warned of fraudulent websites Chi Nam … [Read more...] about Where are Viber, LINE when the battle to scramble users becomes fierce?